Trust Bank Limited Job Circular 2019 has been published. Trust Bank Limited is a sustainable financial institution through financial inclusion as the dynamic commercial bank. Trust Bank is a contemporary, upbeat brand of distinctive quality of service banking in Bangladesh. 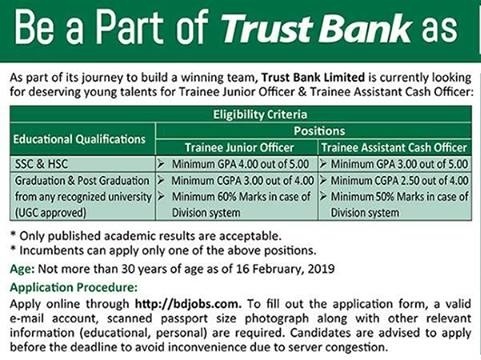 As part of its journey to build a winning team, Trust Bank Limited is currently looking for deserving young graduates as Junior Officer, Trainee Assistant Cash Officer. So if you are ready to take a voyage in a vibrant and challenging corporate environment and eager to fast track your career in a professional and institutionally managed environment please to apply to Trust Bank Job Circular Junior Officer, Trainee Assistant Cash Officer. Trust Bank Limited Job Circular 2019. *Please take a color print of the Admit Card. *Please bring your Admit Card during examination. 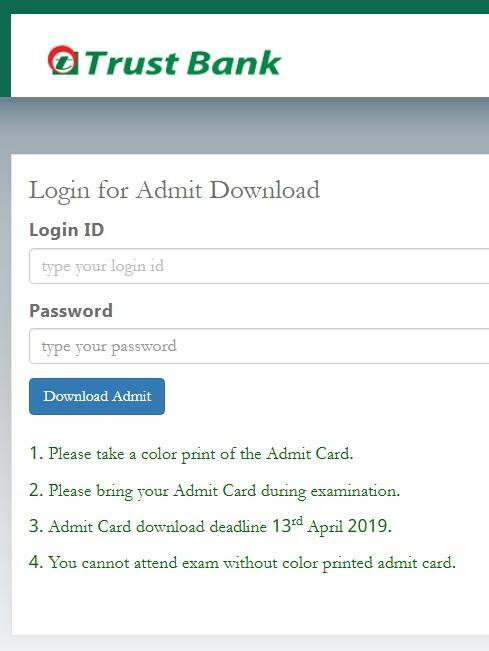 *You cannot attend exam without color printed admit card. 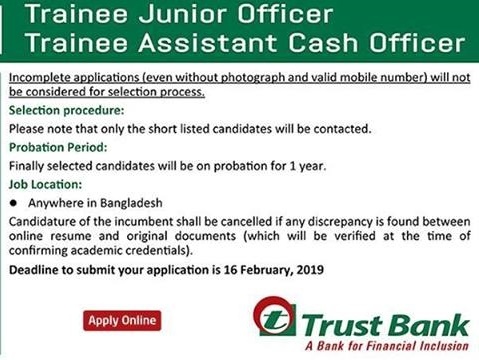 Trust Bank Job Circular Application Deadline March 03, 2019. Trust Bank is an equal opportunity employer. Please note that only the shortlisted candidates will be contacted. Finally selected candidates will have to undergo on probation for 1 year. Satisfactory on the job performance, the incumbent shall be confirmed as ‘Senior Officer’ under banks regular scale. Candidates not qualified as Junior Officer, Trainee Assistant Cash Officer may be considered for selection as Junior Officer, Trainee Assistant Cash Officer. Candidature of the incumbent shall be canceled if any discrepancy is found between the online resume and original documents (which will be verified at the time of final selection). Trust Bank Limited Job Circular 2019.